The first round of installations was completed for the Yucca Mountain Expansion project for the California Institute of Technology and Harvard-Smithsonian. The project, funded by the U.S. Department of Energy, is part of the Yucca Mountain feasibility study. GPS data will be used to determine crustal stability of this region, which will be used for nuclear waste storage. Sites were installed and/or upgraded in southern Nevada; Death Valley, California; northwestern Arizona; and southwestern Utah. 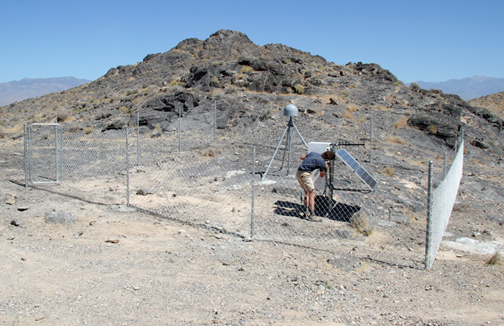 Two UNAVCO field engineers installed eight permanent GPS stations and two repeaters on previously installed monuments. Each GPS site includes a Trimble NetRS receiver and a Trimble chokering antenna, and either an Intuicom wireless Ethernet bridge radio or a Proxicast CDMA modem for communications. Data are monitored and processed at Harvard-Smithsonian. An additional ten sites will be installed when monumentation is complete.